Spain Removals - Moving From One Part Of Spain To Another? Spain removals services for expats are not limited to moving your furniture and other worldly goods from the UK to Spain. You could equally be moving across the country you�re living in! In Spain, where the housing market is comparatively affordable, it�s often either necessary or desirable to purchase a new property in a different region. Perhaps you�re looking for a second home for holidays on the beach; or maybe you need to transfer for work reasons to a bigger city such as Barcelona or Catalonia. 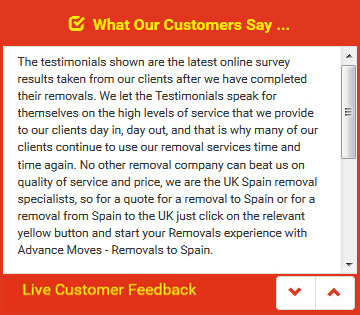 Read on to find out the benefits of buying removals to Spain services from UK experts located within the country itself. Like many other expats from the United Kingdom who have moved over to Spain for the sun, sea and sand, you�re probably enjoying a better quality of life for the quarter of the price. Not only is the euro stronger than the pound at the moment, but the Mediterranean housing market is generally in favour for those who come from other countries and have enough money to buy properties. That�s why in countries such as Spain, there�s potentially a lot more freedom when it comes to housing. You don�t have to stay in the same house for years. Many find Barcelona, for example, a particularly attractive spot due to the cultural landmarks, the enjoyable nightlife and the unbeatable climate of the city. But the perfect villa or apartment in an ideal location is nothing without personal belongings and furniture to fill it up with. That�s why transport removals to Spain from UK companies are so necessary and are in high demand. One of the main advantages of using a UK firm based in Spain is that they speak your language � literally and metaphorically. Find an English company that offers a premier removals Spain service and there will be no language difficulties. More than that, it�s a lot easier for you to check out their reputation, online or by speaking to previous clients. With their finger on the pulse locally, such Spain removals firms can negotiate the best deals on their own equipment, keeping costs to you, the client, as low as possible. Barcelona isn�t the only attractive location in Spain. Many expatriates have their sights set on the Catalonia region in the north-east, particularly known for the exotic beach resorts on the Costa Brava, the impressive Pyrenees Mountains and the distinctive architecture that�s quintessentially Spanish. Its eased and relaxed lifestyle makes it a prime destination for Brits who are moving from the United Kingdom or directly from another part of Spain itself. After finding a great property to live in, the hardest part is the arduous task of transporting all of your belongings to your new home. One of your priorities must be booking a Spanish removals service to transport your possessions from one place to the other. If you want to save the hassle of a disorganised move and damaged possessions, look for a firm that understands your concerns and takes steps to address them. One sure guarantee of a quality service is by sourcing a firm that adheres to UK standards and has membership of a reputable professional body, such as the British Association of Removers. Check that the staff the removals Spain company uses are trained in the best methods of packaging and protecting your goods while in transit. Another valuable service to seek out is having a manned office number, so you can negotiate your move and ask for advice while it�s in progress. If you�re looking for an expert company, then remember the name Advance Moves. With nearly fifteen years� experience in the transportation of clients� goods both to and from Spain and within the country, you�ll know your move will be in safe hands. We�re Advance Moves � a premier company dealing in Spain removals. We have depots situated in both Spain and the United Kingdom, so no matter if you�re relocating from country to country or just moving across the same region, we�ll be able to move your possessions with the proficiency and professionalism associated with a respected member of the British Association of Removers. To contact us, you can either drop us a message via our contact form at http://www.advancemoves.com/, or call us on 0871 218 0612 within Spain. We look forward to hearing from you � and potentially working with you for removals to Spain too!